A specially selected collection of three seasonal goats' cheeses; paired with our White Fig confit. Cheese is traditionally at its best when made with spring milk, after a winter diet of dry hay and feed, the flush of nutritious tender grass, herbs, and wildflowers helps dairy animals to produce richer milk, with more depth of flavour. Fleur de Sologne 80g - A pretty soft French goats cheese with a natural rind and creamy delicate flavour. Ticklemore 250g - A white rinded goats milk cheese made in the Dart Valley. Rich, citrusy and refreshing in flavour. Mini Cerney 140g - An attractive goats cheese coated with an ash and sea salt mix. Dense textured with a delicate citrus flavour. White Fig Confit 45g - The sweet mellowness of white fig (60%), raisins and a touch of bay leaf is ideal on or accompanying any goats cheese. 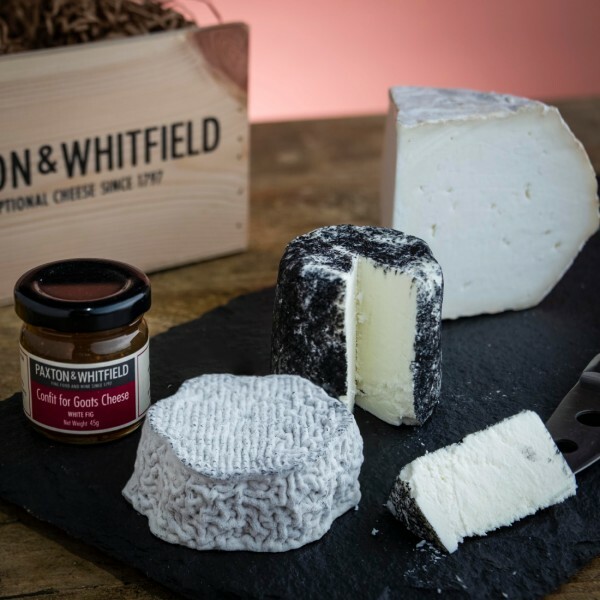 Our cheese is hand-cut to order by our professional cheesemongers and delivered in optimal condition; packaged in a branded Paxton & Whitfield box, with ice-packs for a chilled arrival. Every cheese is delivered with approximately 12 days shelf life from the date of despatch and is sent on a tracked, 24 hour delivery service to the UK (delivery service varies to some international locations). Our White Fig Confit, hand made in the French Pyrenees, is made with sweet white figs, juicy raisins and a touch of bay leaf. It is the perfect accompaniment to a creamy goats cheese such as Ragstone.